Broken windows theory asserts that norm-violations are often self-perpetuating. In a neighbourhood that is pervaded by signs of norm-violation (e.g., litter, graffiti, broken windows), people will be more likely to violate social norms themselves. The reason being that the presence of such signs leads people to conclude that wanton norm-violations evidently go unpunished in that neighboured. An important implication of broken windows theory is that the costs of public bads such as litter are greater than those entailed by their mere unsightliness. There is both correlational and experimental evidence for broken windows theory. Consistent with earlier studies, Schultz et al. (2011, Environment and Behavior) found that the amount of litter present at a site was positively associated with the littering rate. Similarly, Nettle et al. (2011, PLOS ONE) documented that individuals were less likely to return a letter in a neighbourhood where there was more litter. Keizer et al. (2008, Science) famously showed, using field experiments, that individuals were more likely to drop litter in a passageway when it was covered in graffiti, and that they were more likely to steal €5 from a postbox when it was surrounded by litter. Some of their results were questioned on methodological and statistical grounds by Wicherts & Bakker (2014, Group Processes & Intergroup Relations). Yet two further studies (Keizer et al., 2013, PLOS ONE; Keuschnigg & Wolbring, 2015; Rationality and Society) have bolstered the conclusion that people are more likely to violate social norms where signs of norm-violation prevail. Since many policy makers are probably not aware of these results, they may well be under-allocating resources to the prevention and removal of litter, graffiti and broken windows etc. One prescription would be to increase the penalties for littering (and other such things) in order to deter prospective norm-violators. Another (more contentious) prescription would be to fine landlords, home-owners and businesses who permitted litter and graffiti to accumulate on or around their properties. While not especially fair, this policy would give property-owners themselves an incentive to take precautions against norm-violators. Indeed, they might be in a better position to take such precautions than policy-makers would be to impose them. The trick would be setting the fine appropriately. Further to my two previous posts on fracking and social mobility, here I present additional evidence that upward mobility tends to be higher in areas with fracking, but only for boys. As noted in my last past, the reason why one should not expect upward mobility for girls to be higher in areas with fracking is that fracking is an overwhelmingly male-dominated industry. My previous posts utilised Chetty et al. 's new estimates of the causal impact of growing up in different commuting zones (CZ). Yet Chetty et al. also report new estimates of the causal impact of growing up in different counties. Counties constitute a much finer-grained level of analysis than CZs; there are more than 2,400 counties in the US, yet only around 700 CZs. The chart below, which is based on the same methodology as before, plots the percentage of counties at a given rank or higher located in fracking states against rank on individual income causal impact, separately for boys and girls. Overall, 23% of counties are located in fracking states. Once again, the line for boys is substantially higher than the line for girls, especially on the left-hand side. What's more, the line for boys is strictly above 23%, whereas the line for girls is strictly below 23%. This indicates that counties located in fracking states are overrepresented among those with the largest causal impacts for boys, but are underrepresented among those with the largest causal impacts for girls. For boys: ~44% of the top 50 counties are located in fracking states, 60% of the top 20 are located in fracking states, and 90% of the top 10 are located in fracking states. For girls, by contrast: 0% of the top 50 counties are located in fracking states. Counties located in North Dakota, Texas, Utah and Wyoming are all well-represented at the top of the boys' ranking. In a post last week, I noted that children who grow up in commuting zones (CZs) located in fracking states tend to have high rates of upward income mobility, as measured by Chetty et al. 's new estimates of the causal impact of growing up in different CZs. A caveat was that this tendency appeared to be almost entirely accounted for by a single fracking state, namely North Dakota. Here I provide further evidence that upward mobility tends to be higher in areas with fracking. Once again, 27% of CZs are located in fracking states. Importantly, the line for boys is substantially higher than the line for girls, especially on the left-hand side. Moreover, the line for boys is strictly above 27%, whereas the line for girls is below this percentage from rank 8 onwards. (The line for girls begins at 100% since the highest-ranked CZ happens to be located in fracking state). This indicates that, as expected, CZs located in fracking states are overrepresented among those with the largest causal impacts for boys, but are underrepresented among those with the largest causal impacts for girls. For boys: 48% of the top 50 CZs are located in fracking states, 65% of the top 20 are located in fracking states, and 90% of the top 10 are located in fracking states. For girls, by contrast: 16% of the top 50 CZs are located in fracking states, 15% of the top 20 are located in fracking states, and 20% of the top 10 are located in fracking states. And unlike last time, North Dakota is not the only fracking state well-represented at the top of the boys' ranking: CZs located in Texas and Wyoming also preponderate there. I recently came across a paper (Walasek & Brown, 2015, Psychological Science) that documents an association across US states between income inequality and Google searches for status goods (e.g., "ralph lauren mens"). In other words, searches for status goods were relatively more common in states with higher income inequality. 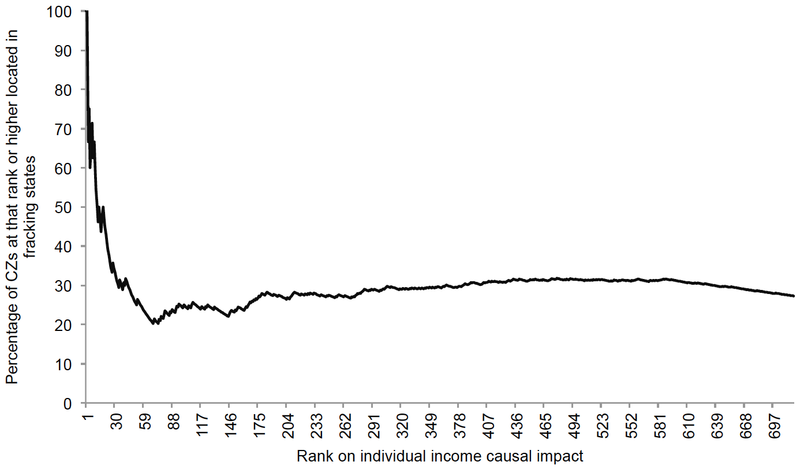 The authors interpret this as evidence that people become more concerned about social rank when income inequality is greater. After reading the paper, I was playing around with Google Correlate when I noticed a strong negative association between searches for "global warming myth" and searches for status goods. To be systematic, I downloaded Google Correlate data for each of 15 status goods (comprising 5 luxury fashion brands, 5 luxury jewellery brands, and 5 luxury car brands): "ralph lauren", "gucci", "louis vuitton", "burberry", "prada", "bvlgari", "cartier", "tiffany", "rolex", "omega", "ferrari", "lamborghini", "porsche", "aston martin" and "maserati". The first principal component from a PCA on these 15 search terms explained 69% of the variance, and the screeplot strongly suggested a single dimension in the data. I also downloaded the Google Correlate data for "global warming myth" and "global warming hoax", and took an average across these two search terms (they were correlated at r = .94, p < 0.001). 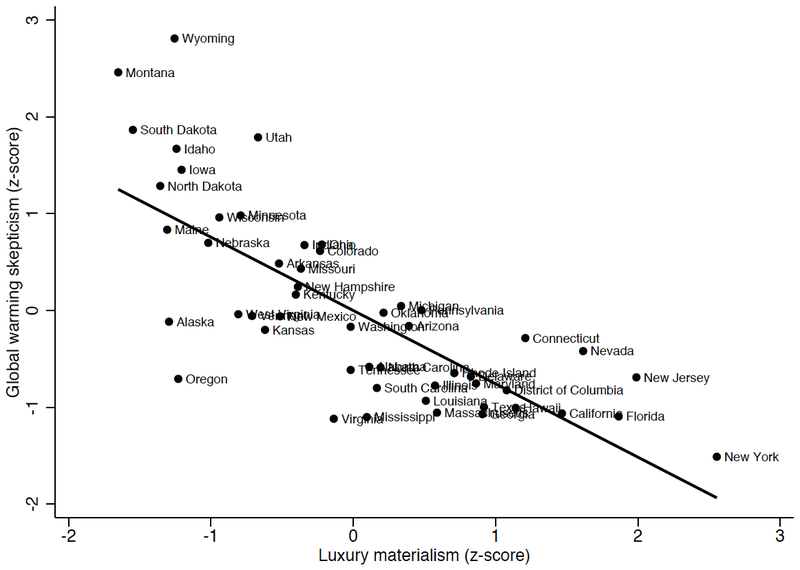 The chart below plots global warming scepticism against luxury materialism (i.e., the principal component from the 15 search terms) for all 51 states. The relationship is strongly negative, namely r = –.76 (p < 0.001). Unsurprisingly perhaps, New York is the most materialistic state. And Wyoming is the state most sceptical about global warming. In general, red states tend to be more sceptical about global warming, while blue states tend to be more materialistic. Obama vote share in 2012 is correlated at r = –.48 (p < 0.001) with global warming scepticism and at r = .49 (p < 0.001) with luxury materialism. To check the robustness of the relationship, I adjusted for the following variables using multiple linear regression: log GDP per capita, median income, urbanisation, log energy use per capita, Gini coefficient, Obama vote share, and fracking state. Standardised coefficients are given in the table below. Luxury materialism remains strongly and significantly associated with global warming scepticism after adjusting for these variables. The negative association between global warming scepticism and luxury materialism is at least somewhat unexpected. One might have thought people with a taste for superfluous luxury goods would be more sceptical about a phenomenon that has led to calls for massive reductions in human consumption. Aside from the obvious possibility of an ecological fallacy, a caveat is that luxury materialism is not necessarily equivalent to mass consumerism, or indeed ecological impact. In fact, log energy use per capita is positively correlated with global warming scepticism (r = .45, p < 0.001), and negatively correlated with luxury materialism (r = –.55, p < 0.001). Yet statistically, energy use per capita does not seem to account for the association between global warming scepticism and luxury materialism. I have no straightforward explanation for the association. I'd be interested to hear if anyone else has one. The economist Raj Chetty and his colleagues have just published a new working paper that examines spatial variation in upward income mobility across the United States. This study builds on an earlier paper they published on spatial variation in mobility. Their earlier paper first came to the attention of the media in 2013. Since then, a number of commentators have pointed out that upward mobility seems to be particularly high in areas with hydraulic fracturing (commonly known as "fracking"). For example, the highest upward mobility rate in the country was observed in Bowman, North Dakota, which is adjacent to the heavily fracked Bakken shale. Chetty and colleagues' latest paper investigates the causal effect of growing up in a particular area on an individual's future income. Their method was to calculate, for individuals with parents at the 25th percentile of the national income distribution in each of 718 commuting zones, "the percentage increase gain (or loss) in income at age 26 from spending one more year of childhood in a given commuting zone relative relative to the national mean". They calculated such figures for both household income at age 26 and individual income at age 26. Here I examine whether, measured this way, upward mobility does in fact tend to be higher in areas with fracking. Chetty and colleagues' preferred estimates of the causal impact of growing up in different commuting zones (CZs) were downloaded from the Equality of Opportunity Project's webpage. I divided CZs into those located in fracking states, and those located in non-fracking states. Fracking states were defined as those in which >1,000 fracking wells have been drilled since 2005, namely: Arkansas, Colorado, Louisiana, New Mexico, North Dakota, Oklahoma, Pennsylvania, Texas, Utah, West Virginia, and Wyoming. 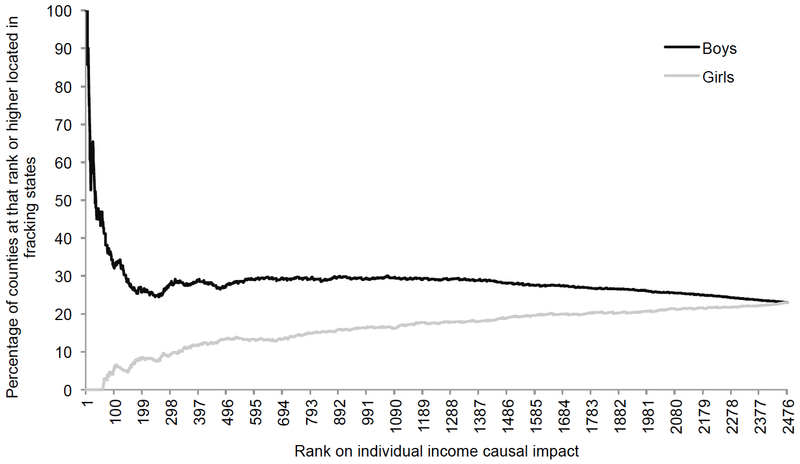 I then ranked CZs from highest to lowest causal impact, separately for household income at age 26 and individual income at age 26 . 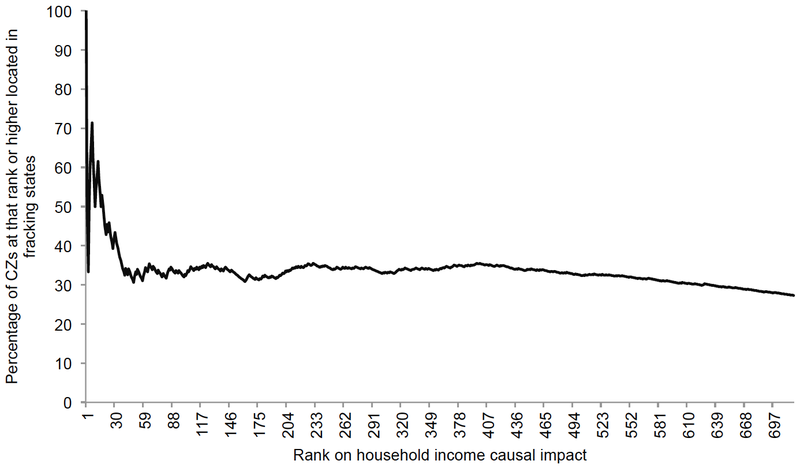 The first chart (below) plots the percentage of CZs at a given rank or higher located in fracking states against rank on household income causal impact. Overall, 27% of CZs are located in fracking states, which is why the line tails off to 27% on the right-hand side. The marked uptick on the left-hand side indicates that CZs located in fracking states are overrepresented at the highest ranks. 32% of the top 50 CZs are located in fracking states, 45% of the top 20 are located in fracking states, and 50% of the top 10 are located in fracking states. 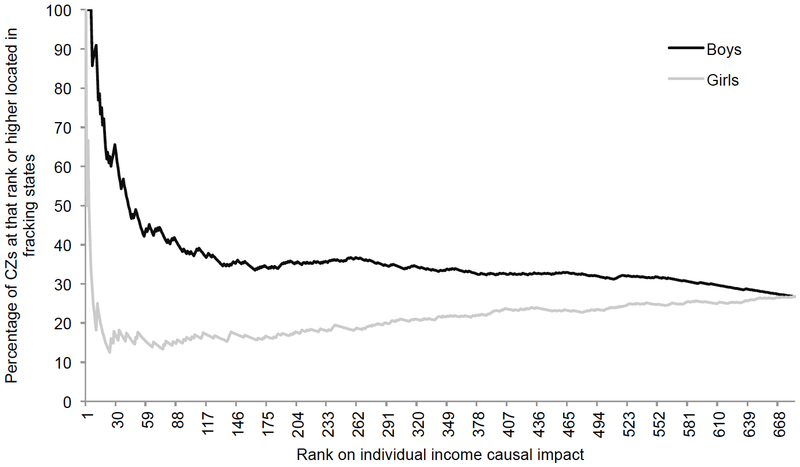 The picture is even clearer in the second chart (below), which plots the percentage of CZs at a given rank or higher located in fracking states against rank on individual income causal impact. Here, 26% of the top 50 CZs are located in fracking states, 45% of the top 20 are located in fracking states, and 60% of the top 10 are located in fracking states. However, closer scrutiny of the two lists of rankings revealed that nearly all the highest ranked CZs located in fracking states happened to be located in North Dakota. When North Dakota was excluded from the rankings, there was no longer any tendency for CZs located in fracking states to be overrepresented at the highest ranks. Thus, it is possible that it is not fracking per se that gives rise to high upward mobility, but something specific to North Dakota. On the other hand, there may be a considerable number of high ranked CZs outside of but adjacent to fracking states where many individuals employed in the fracking industry live. 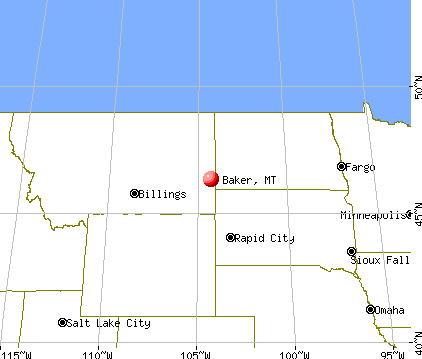 For example, Baker, Montana, which has the second highest household income upward mobility, is located right on the border with North Dakota, next to the Bakken shale. A more fine-grained analysis would assign fracking status separately to each CZ based on the number of individuals employed in the fracking industry there or some other suitable measure.